Frontier Developments recently released Jurassic World Evolution in partnership with Universal, but it continues to support Planet Coaster and Elite Dangerous as well. In an interview published on the latest PC Gamer magazine (September 2018, issue 321), Frontier Developments CEO David Braben talked about the studio’s recent growth in staff as well as their next game’s reveal, due to happen between late 2018 and early 2019. 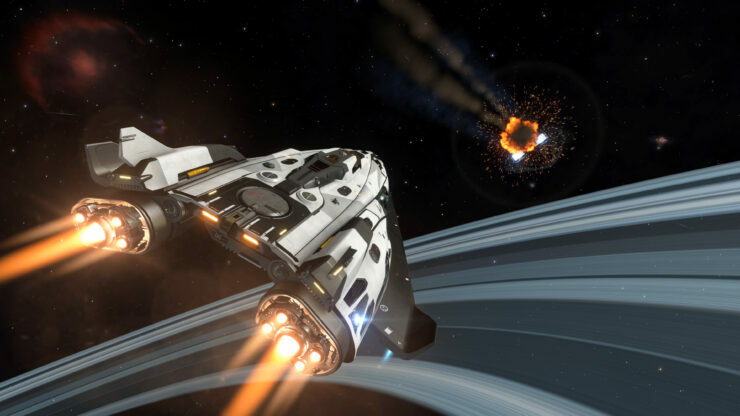 He also promised Elite Dangerous will be updated with exciting things, both free and paid. What happened is we’ve become more visible, we’ve taken on around 50 people a year for the last few years, and that’s been really good for us. We’re in the new office which is really nice. What it’s meant is we’ve continued to support and nurture the existing franchises. Elite Dangerous has continued to grow, the team size is actually getting bigger. Planet Coaster has continued to be supported. We’ve got the Adventure Pack, the Spooky Pack, the Studios Pack, there’s another one to come which we’ll be announcing shortly and then there will be more after that… Each of these things has some free stuff in and some paid stuff. And I personally don’t feel like there’s any issue with that. With the paid stuff, you’re getting a lot of new things. The Studios Pack also adds hotels and lots of other mechanics to do with that. We would do something similar with Jurassic World Evolution as well – continue to support it over time. And then, of course, we’re hard at work on the fourth game. We’re not saying what that is yet, but we’ll say when it’s the right time, which will be a way off – probably either at the back end of the year or early next year. But obviously we’re excited about that as well, and with Jurassic World Evolution finishing, we’ll be kicking off other projects. We’ve already got a small team on the fifth game, we’re looking at it… so we have a nice flow-through. From a staff point of view as well it’s also really good too because people who have been on Elite for five or six years now might want to change and we can offer that change inside the studio. And what’s good for Elite is it brings in a lot of fresh blood and fresh ideas, which is always good for a game. It keeps it alive and keeps it positive. The plan was – beyond the current season for Elite, which is mostly announced – there are a lot of things that we will be announcing that are really exciting, some of which will be free, some of which will be paid. So it’s that quite healthy mix that is very good for the studio and is really good for the game. What would you like to see next from Frontier? Let us know below!